The years are recorded in rings inside the trunk of a tree, but how was time recorded in his own body? Time didn’t spread out gradually, ring after ring, nor was it lined up neatly in a row; could it just be a disorderly pile, like the inside of a drawer no one ever bothers to straighten? Yoshiro’s main concern in life is to care for his great-grandson Mumei, a boy who loves his Illustrated Guide to Animals, even though he’ll never see many of the creatures depicted in it (that’s if they’re still around). Though Yoshiro would like to look after Mumei’s health, the information on child health changes so fast these days that he feels it’s hardly worth keeping up: “Unable to foresee what sort of fate awaited Mumei in the future, Yoshiro kept his eyes open, taking each day as it came, hoping the present wouldn’t crumble under his feet.” The Last Children of Tokyo is in large part a portrait of Yoshiro skating along on the surface of that fragile present (not just with Mumei, but also with the two generations of his family between). The world of Tawada’s novel is strange and striking: giant mutant dandelions grow rampant, and certain words have been replaced with more palatable expressions (orphans, for example, are now referred to as “independent children”). This world exists at a point where the reader’s ability to rationalise what may have happened between now and then is balanced finely against the characters’ fading knowledge. It leaves the reader in the same precarious position as Yoshiro: we can’t envision the edges of Tawada’s world, and therefore can’t be certain of where its story will lead. Things are indeed grim, but there may be hope… if you know where to look. 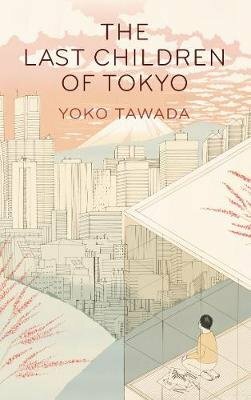 The Last Children of Tokyo (2014) by Yoko Tawada, tr. Margaret Mitsutani (2017), Portobello Books, 140 pages, paperback (source: review copy). The US edition of this book is titled The Emissary and published by New Directions. I keep reading about this. It does sound good, but I suspect too that the publisher is putting some major marketing push behind it. You’ve got me there, Max. 🙂 Granta/Portobello were doing a blogger promotion on Japanese lit, and they sent me this book (and Tawada’s Memoirs of a Polar Bear) as part of that. Having said that, I don’t know whether I’d have chosen to read Last Children otherwise, but I’m glad I did. I just finished this last night. I enjoyed it, but found it perhaps a little slight. The exploration of communication was interesting – Yoshiro’s desire not to burden Mumei with his fears; Mumei’s unspoken understanding of Yoshiro’s unvoiced thoughts. That too and the changes in language reflecting the diminution of society – a closed-off Japan closing off language and so intellectual borders as well as physical. I know what you mean about it possibly being a little slight; I get the impression that Tawada’s other novel in English translation, Memoirs of a Polar Bear, may be more substantial. Having said that, there are some interesting themes and a strong sense of place.